Alpacas originated in South America and were generally kept in herds that grazed in the Andes Mountains in Peru. Alpacas are the same species as camels and llamas. There are two types of alpacas, the suri alpaca and huacaya alpaca. 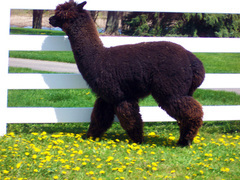 The alpacas on our farm are huacayas, which have a rounder and more bulky appearance than a suri. Huacayas’ fiber grows perpendicular to the body, giving them denser, smoother curls and an almost sponge- like fiber. Alpacas have been specifically bred for their fiber and are not generally considered a work animal. Their fiber is sheared once a year and can be transformed into many high quality goods, such as blankets, sweaters, hats, gloves, socks, bedding, and rugs. There are more than 52 different colors classified in Peru and more than 16 in the United States. Alpaca fiber has been compared to wool but is as soft as cashmere. It is a silky natural fiber that, unlike wool, has no lanolin, which makes it hypoallergenic. It also repels water and is flame resistant. Alpacas in South America are also used for meat. The market in the United States for alpaca meat is growing. It tastes very similar to beef and is said to be healthier for human consumption. 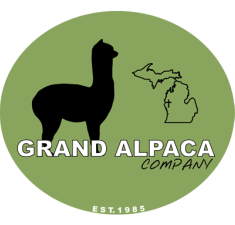 Learn more about Alpaca Meat.